Stop In! We Can't Wait To See You Again! You’ll feel like family at Central Shop Rite. We have been serving the Vassar community for over 75 years and our friendly and helpful associates are ready to assist you with your shopping needs. Enjoy smiling cashiers and convenient carry–out service every day at checkout. Browse well–stocked shelves and enjoy top–quality products like fresh Natural Angus beef and our own smoked meats and store–made brats in our Meat department, as well as other great products throughout the store like Our Family brand products, and Hallmark greeting cards. Our Deli and Bakery experts are ready to serve you with quality Kretschmar deli items and fresh–baked–from‐scratch donuts available daily; there is nothing like them! Entertaining or have an event coming up? Talk to our experts about fresh and delicious deli platters and custom cakes and cupcakes. You will find many other great things to keep you coming back, like our special Craft Beer section, and local favorites like Koegel’s quality meats. And when you come in, don’t be surprised if our friendly staff greets you by name! 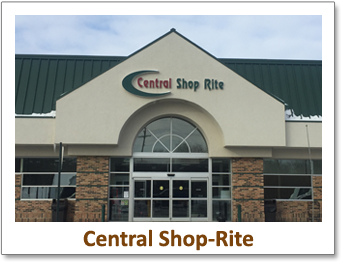 We’re ready every day to serve you and make your shopping experience at Central Shop Rite the best you’ve ever had, because we think that is how it should be.